Ravenscourt was built on Clifton Drive South c1902, for Manchester solicitor Walter John Sacré. He lived at Ravenscourt until about 1914 when he moved to a house on St.Annes Road East. His mother lived in a house on North Promenade. Walter's father was Charles Reboul Sacré (1831-89) a well-known railway engineer. He was Engineer and Superintendent of the Locomotive and Stores Department of the Manchester, Sheffield and Lincolnshire Railway. He retired in 1886. The Sacré family had lived in Manchester since the 1850s and in the 1880s were living in Victoria Park. It was there, in 1889, that Charles committed suicide with a shotgun 'whilst in an unsound state of mind.' His estate was valued at £165,000 in 1890. The family appear to have moved to St.Annes in the 1890s. When built, Ravenscourt was no.18, Clifton Drive South. In the 1950s houses in Clifton Drive were renumbered so this is now 286 Clifton Drive South. 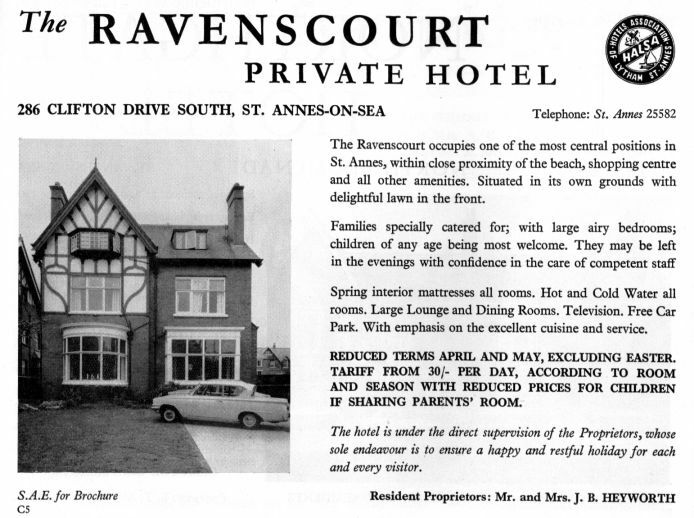 Ravenscourt later became a hotel and in the 1960s & 70s, it was run by the Heyworth family.